Cities are on the front lines of this global crisis. As the number of urban displaced persons grows, so does the moral imperative to welcome and embrace them. 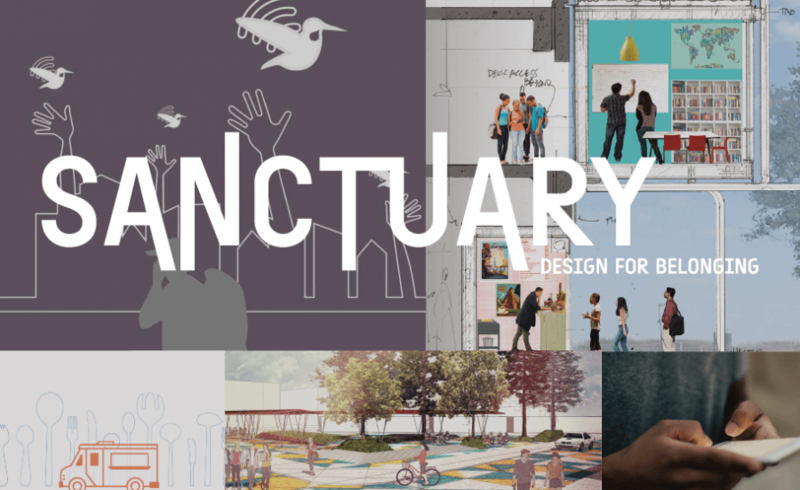 Sanctuary: Design for Belonging presents design ideas from Displaced: Design for Inclusive Cities, a competition seeking game-changing design solutions addressing the global refugee and immigrant crisis in an urban context. Proposals to create opportunity and enhance a sense of belonging are grouped into five functional themes that emerged from the competition entries: Social innovation, Shelter, Resource Hubs, Gathering Spaces and Story Telling. To encourage deeper understanding of the lives of immigrants and refugees in Puget Sound, the exhibit also includes examples of local organizations, resources, communities, solutions, and design imaginations that provide sanctuary. Guests are also welcome and encouraged to take and publicly display a copy of a specially-commissioned poster by Raychelle. Join us for the Opening Night Reception, December 6, 6:00 PM – 8:00 PM @ the Center. This event has passed. Free Exhibit Tours: December 12 & January 24, 5:30 PM – 6:30 PM. Meet us at the Center for a curatorial tour by our Graphic Art Curator, Cleo Barnett (December 12) and Research Curator, Mayumi Tsutakawa (January 24). During these hour-long tours, our curators will discuss the overall theme of the exhibit, explaining the competition winners’ projects and how they make cities more welcoming to immigrants and refugees, and also speak to the design and social innovation behind protest posters. Color My Home: An Architecture Workshop for Kids (ages 10-14), January 26, 1:00 PM – 4:00 PM @ the Center.